Late Check Out as you'll never want to leave! 1. This special is available for purchase until 5:00pm (AEST) Wednesday 1 May 2019. 2. Valid for travel from 29 April to 12 December 2019. A $125 surcharge applies on Friday and Saturday nights. 3. The travel period has black-out dates: 28 Jun - 21 Jul, 20 Sep - 6 Oct & 1 - 3 Nov 2019. 4. Your booking must be confirmed by Wednesday 1 May 2018. If your booking is not confirmed you will forfeit the purchase price. 5. Bookings are essential and subject to availability. To book your stay call us or book online. 6. A voucher will be sent to you by email on confirmation of payment. 7. 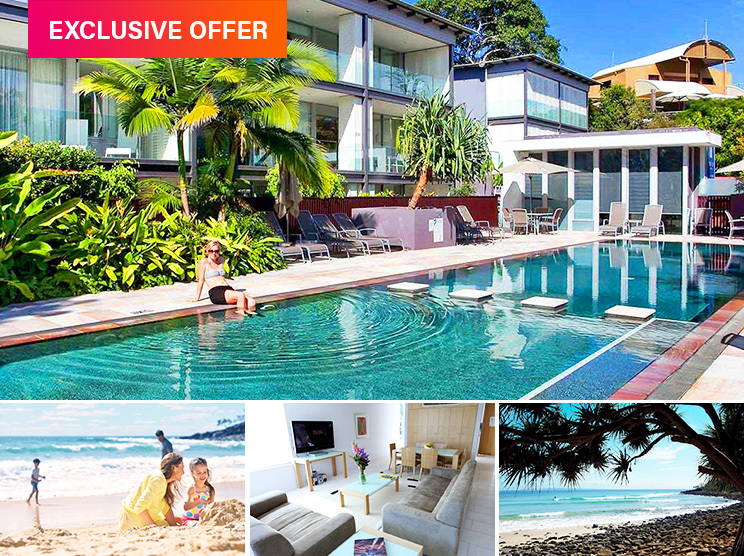 This special is valid for up to 4 guests in a 2 Bedroom or 6 guests in a 3 Bedroom. 8. Maximum room capacity is 5 guests in a 2 Bedroom or 7 guests in a 3 Bedroom. 9. Extra person charge is $?? per night. Infants (0-2 years) stay free of charge using existing bedding. 10. Extra nights may be purchased at time of booking at the same per night price. 11. Bookings are non-refundable, non-exchangeable and no cancellations or amendments under ANY circumstances. We strongly recommend taking out a travel insurance policy at the point of booking. 12. This offer cannot be used in conjunction with any other offer or combined with any other form of discount or membership. 13. Please note all advertised pricing is in AUD (Australian Dollars). 14. A 2.5% booking fee applies. Stays including Friday and Saturday nights include a $119.50 surcharge per night. The Rise Noosa is set on a hillside overlooking the peaceful haven of Noosa Heads and only minutes away from cosmopolitan Hastings St. Breathtaking vistas sweep across the skyline from the ocean to the distant mountains as the sun set reflects a golden light upon the many waterways that meander through Noosa Heads. The open plan apartments are the ultimate in contemporary luxury and coastal living, architecturally designed with the highest regard of comfort and ergonomics in mind. Quality furnishings and fittings, the extensive use of stone flooring and floor to ceiling glass forms a seamless interior / exterior environment from which to enjoy your exclusive hill top location. The Rise Noosa offers a choice of apartment style, single level penthouses or double storey villas. Sitting majestically in a prime position, the resort offers a lifestyle many aspire to. All apartments are fitted with exclusive appliances and fittings; reverse cycle air conditioning; security underground parking; smart card security entry.